In addition, this specification will define CSS properties for blending and group isolation and the properties of the globalCompositeOperation attribute. GitHub Issues are preferred for discussion of this specification. When filing an issue, please put the text “compositing” in the title, preferably like this: “[compositing] …summary of comment…”. All issues and comments are archived, and there is also a historical archive. The first part of this document describes the properties used to control the compositing in CSS. The second part will describe the algorithms of Porter Duff compositing and blending. Each section of this document is normative unless otherwise specified. This specification defines a set of CSS properties that affect the visual rendering of elements to which those properties are applied; these effects are applied after elements have been sized and positioned according to the Visual formatting model from [CSS21]. Some values of these properties result in the creation of a containing block, and/or the creation of a stacking context. The background-blend-mode property also builds upon the properties defined in the CSS Backgrounds and Borders module [CSS3BG]. This specification also enhances the rules as specified in Section 14.2 Simple alpha compositing of [SVG11] and simple alpha compositing of [CSS3COLOR]. This module also extends the globalCompositeOperation attribute. The compositing model must follow the SVG compositing model [SVG11]: first any filter effect is applied, then any clipping, masking, blending and compositing. Everything in CSS that creates a stacking context must be considered an ‘isolated’ group. HTML elements themselves should not create groups. An element that has blending applied, must blend with all the underlying content of the stacking context [CSS21] that that element belongs to. By default, every element must create a non-isolated group. The blend mode defines the formula that must be used to mix the colors with the backdrop. This behavior is described in more detail in Blending. Note: Applying a blendmode other than normal to the element must establish a new stacking context [CSS21]. This group must then be blended and composited with the stacking context that contains the element. ... the output will be the image blending with the lime background of the <body> element. Blending of a transparent image on a lime backdrop. ... the output will be blending of the 3 circles. Each circle is rendered from bottom to top. 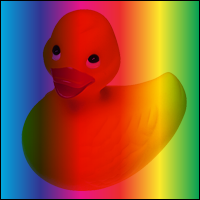 Where the elements overlap, the blend mode produces a change in color. ... the opacity on the <div> element is causing the creation of a stacking context. 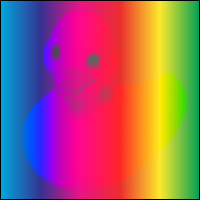 This causes the creation of a new group so the image doesn’t blend with the color of the <body>. Example of blending within a stacking context. 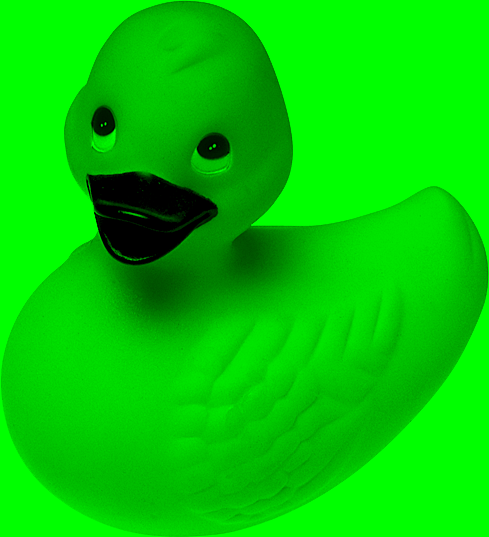 Note how the image is not blending with the lime color. Text with a blend overlay on top of an image. In SVG, this defines whether an element is isolated or not. For CSS, setting isolation to isolate will turn the element into a stacking context. By default, elements use the auto keyword which implies that they are not isolated. However operations that cause the creation of stacking context [CSS21] must cause a group to be isolated. These operations are described in 'behavior specific to HTML' and 'behavior specific to SVG'. In CSS, a background image or the content of an img must always be rendered into an isolated group. For instance, if you link to an SVG file through the img tag, the artwork of that SVG will not blend with the backdrop of the content. In SVG, mask always creates an isolated group. 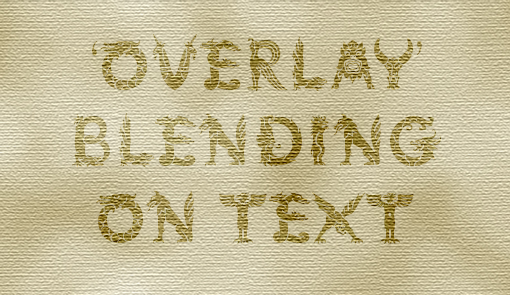 Defines the blending mode of each background layer. Each background layer must blend with the element’s background layer that is below it and the element’s background color. Background layers must not blend with the content that is behind the element, instead they must act as if they are rendered into an isolated group. The background-blend-mode list must be applied in the same order as background-image [CSS3BG]. This means that the first element in the list will apply to the layer that is on top. If a property doesn’t have enough comma-separated values to match the number of layers, the UA must calculate its used value by repeating the list of values until there are enough. If the background [CSS3BG] shorthand is used, the background-blend-mode property for that element must be reset to its initial value. Blending of 2 background images. 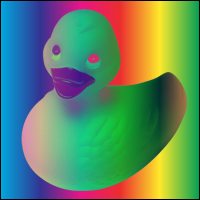 Note that the gradient is not blending with the color of body. Instead it retains its original color. The canvas 2d context defines the globalCompositeOperation attribute that is used to set the current compositing and blending operator. Compositing is the combining of a graphic element with its backdrop. In the model described in this specification there are two steps to the overall compositing operation - Porter-Duff compositing and blending. The blending step determines how the colors from the graphic element and the backdrop interact. Typically, the blending step is performed first, followed by the Porter-Duff compositing step. In the blending step, the resultant color from the mix of the element and the the backdrop is calculated. The graphic element’s color is replaced with this resultant color. The graphic element is then composited with the backdrop using the specified compositing operator. Note: Shape is defined by the mathematical description of the shape. A particular point is either inside the shape or it is not. There are no gradations. Note: Opacity is described using an alpha value, stored alongside the color value for each particular point. The alpha value is between 0 and 1, inclusive. A value of 0 means that the pixel has no coverage at that point, and is therefore transparent; i.e. there is no color contribution from any geometry because the geometry does not overlap this pixel. A value of 1 means that the pixel is fully opaque; the geometry completely overlaps the pixel. Note: All values are between 0 and 1 inclusive. 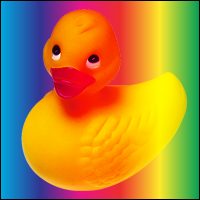 The pixel value after compositing (co) is given by adding the contributions from the source graphic element [Cs x αs] and the backdrop [Cb x αb x (1 - αs)]. For both the graphic element and the backdrop, the color values are multiplied by the alpha to determine the amount of color that contributes. With zero alpha meaning that the color does not contribute and partial alpha means that some percentage of the color contributes. The contribution of the backdrop is further reduced based on the opacity of the graphic element. Conceptually, (1 - αs) of the backdrop shows through the graphic element, meaning that if the graphic element is fully opaque (αs=1) then no backdrop shows through. This describes the most basic case. It consists of 1 shape that is filled with a solid color (α = 1). The shape is composited with an empty background. 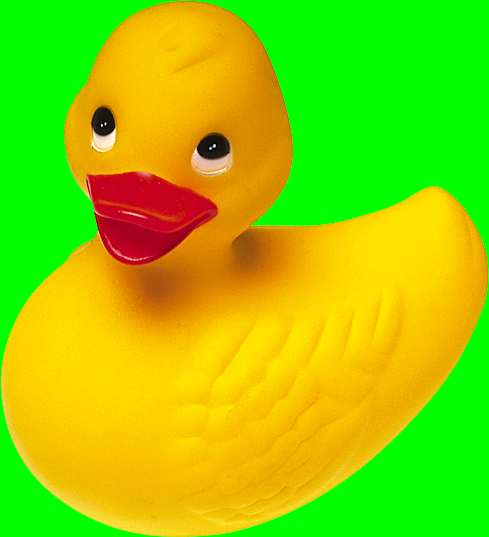 The empty background has no effect on the resultant composite. This is a more complex example. There is no transparency, but the 2 shapes intersect. This is an example where the shape has some transparency, but the backdrop is fully opaque. Figure 4 shows an example where both the shape and the backdrop are transparent. The general formula for compositing and blending which allows for selection of the compositing operator and blending function comprises two steps. The terms used in these functions will be described in detail in the following sections. The backdrop is the content behind the element and is what the element is composited with. This means that the backdrop is the result of compositing all previous elements. This example has 2 simple shapes. The backdrop for the blue shape includes the bottom right corner of the red shape . The dotted line shows the area that is examined during compositing of the blue shape. The shape in the backdrop has an alpha value. The alpha value of the backdrop shape is preserved when the backdrop is calculated. Compositing groups allow more control over the interaction of compositing with the backdrop. Groups can be used to specify how a compositing effect within a group will interact with the content that is already in the scene (the backdrop). Compositing groups may be made up of any number of elements, and may contain other compositing groups. The default properties of a compositing group shall cause no visual difference compared to having no group. See Group Invariance. A compositing group is rendered by first compositing the elements of the group onto the initial backdrop. 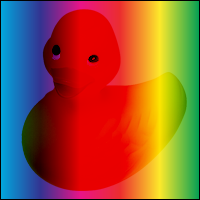 The result of this is a single element containing color and alpha information. This element is then composited onto the group backdrop. Steps shall be taken to ensure the group backdrop makes only a single contribution to the final composite. The initial backdrop is the backdrop used for compositing the group’s first element. This will be the same as the group backdrop in a non-isolated group, or a fully transparent backdrop for an isolated group. The group backdrop is the result of compositing all elements up to but not including the first element in the group. 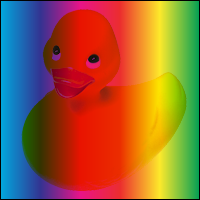 An important property of simple alpha compositing is its group invariance. This behavior is preserved in the more complex model described in this specification. Adding or removing grouping with default attributes shall not show visual differences. 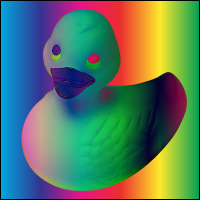 When adding attributes to the group such as isolate, blending modes other than normal or Porter Duff compositing operators other than source-over, groups may no longer be invariant. In an isolated group, the initial backdrop shall be black and fully transparent. In this instance, the initial backdrop is different than the group backdrop. 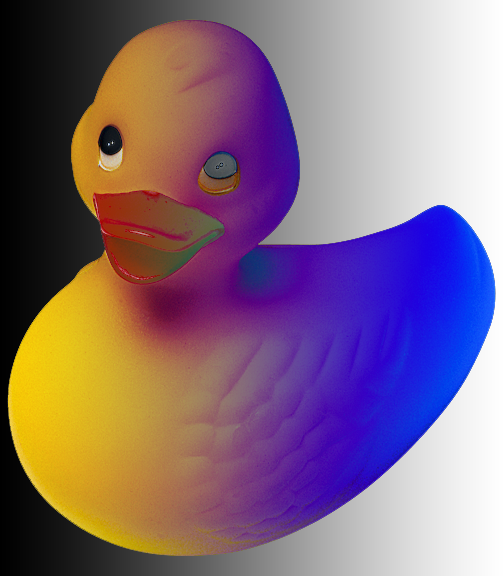 The only interaction with the group backdrop shall occur when the group’s computed color, shape and alpha are composited with it. See 'Isolated groups and Porter Duff modes' for a description of the effect of isolated groups on compositing. See 'Effect of group isolation on blending' for a description of the effect of isolated groups on blending. The top level group is the page group. All other elements and groups are composited into this group. The page group is an isolated group. The page group is composited with a backdrop color of white with 100% opacity. Simple alpha compositing uses the source-over Porter Duff compositing operator. Note: Destination is synonymous with backdrop. The term destination is used in this section as this is considered the standard when working with Porter Duff compositing. Additionally, the compositing operators use destination in their names. The figure above represents coverage of 0.5 for both source and destination. Therefore, the coverage of each region is 0.25 in this example. The landmark paper by Thomas Porter and Tom Duff, who worked for Lucasfilm, defined the algebra of compositing and developed the twelve "Porter Duff" operators. These operators control the results of mixing the four sub-pixel regions formed by the overlapping of graphical objects that have an alpha or pixel coverage channel/value. The operators use all practical combinations of the four regions. There are 12 basic Porter Duff operators, satisfying all possible combinations of source and destination. Only the source will be present. Only the destination will be present. Source is placed over the destination. Destination is placed over the source. The source that overlaps the destination, replaces the destination. Destination which overlaps the source, replaces the source. Source is placed, where it falls outside of the destination. Destination is placed, where it falls outside of the source. Source which overlaps the destination, replaces the destination. Destination is placed elsewhere. Destination which overlaps the source replaces the source. Source is placed elsewhere. The non-overlapping regions of source and destination are combined. Display the sum of the source image and destination image. It is defined in the Porter Duff paper as the plus operator [PORTERDUFF]. When compositing the elements within an isolated group, the elements are composited over a transparent black initial backdrop. If the bottom element in the group uses a Porter Duff compositing operator which is dependent on the backdrop, such as destination, source-in, destination-in, destination-out or source-atop, then the result of the composite will be empty. Subsequent elements within the group are composited with the result of the first composite. Blending is the aspect of compositing that calculates the mixing of colors where the source element and backdrop overlap. Conceptually, the colors in the source element are blended in place with the backdrop. After blending, the modified source element is composited with the backdrop. In practice, this is usually all performed in one step. The blending calculations must not use pre-multiplied color values. The result of the mixing formula must be clamped to the minimum and maximum values of the color range. 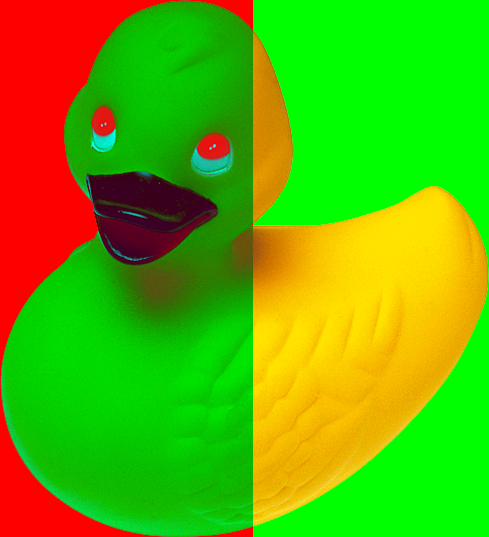 This example has a red rectangle with a blending mode that is placed on top of a set of green rectangles that have different levels of opacity. Note how the top rectangle shifts more toward red as the opacity of the backdrop gets smaller. A blend mode is termed separable if each component of the result color is completely determined by the corresponding components of the constituent backdrop and source colors — that is, if the mixing formula is applied separately to each set of corresponding components. 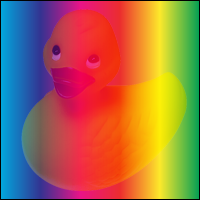 Each of the following blend modes will apply the blending function B(Cb, Cs) on each of the color components. For simplicity, all the examples in this chapter use source-over compositing. This is the default attribute which specifies no blending. The blending formula simply selects the source color. 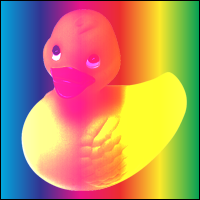 The source color is multiplied by the destination color and replaces the destination. The resultant color is always at least as dark as either the source or destination color. Multiplying any color with black results in black. Multiplying any color with white preserves the original color. Multiplies the complements of the backdrop and source color values, then complements the result. The result color is always at least as light as either of the two constituent colors. Screening any color with white produces white; screening with black leaves the original color unchanged. The effect is similar to projecting multiple photographic slides simultaneously onto a single screen. Multiplies or screens the colors, depending on the backdrop color value. Source colors overlay the backdrop while preserving its highlights and shadows. The backdrop color is not replaced but is mixed with the source color to reflect the lightness or darkness of the backdrop. Overlay is the inverse of the hard-light blend mode. See the definition of hard-light for the formula. Selects the darker of the backdrop and source colors. The backdrop is replaced with the source where the source is darker; otherwise, it is left unchanged. Selects the lighter of the backdrop and source colors. The backdrop is replaced with the source where the source is lighter; otherwise, it is left unchanged. Note: The result must be rounded down if it exceeds the range. See the definition of multiply and screen for their formulas. Subtracts the darker of the two constituent colors from the lighter color. 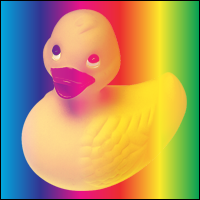 Convert the backdrop and source colors from the blending color space to an intermediate hue-saturation-luminosity representation. Create a new color from some combination of hue, saturation, and luminosity components selected from the backdrop and source colors. 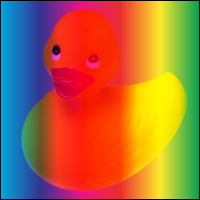 Convert the result back to the original color space. components having the minimum, middle, and maximum values upon entry to the function. Note: In the following example, the elements used to construct the paper airplane are within a group. Each of these elements has their blend mode set to multiply. The airplane on the left is a normal group, the airplane on the right is an isolated group. In the isolated group, the elements within the group are composited onto an empty initial backdrop, this stops the elements within the group multiplying with the backdrop. In the normal group, the elements within the group are composited onto the initial backdrop containing the land and sky. Therefore the elements of the airplane multiply with the land and sky. In both instances, the result of the group composite is composited onto the land and sky using the normal mix-blend-mode (the default mix-blend-mode applied to the group). It is important that the timing to the blending and compositing operations is independent of the source and destination pixel. Operations must be implemented in such a way that they always take the same amount of time regardless of the pixel values. If this rule is not followed, an attacker could infer information and mount a timing attack. A timing attack is a method of obtaining information about content that is otherwise protected, based on studying the amount of time it takes for an operation to occur. If, for example, red pixels took longer to draw than green pixels, one might be able to reconstruct a rough image of the element being rendered, without ever having access to the content of the element. background-blend-mode was changed so it matches repeating behavior of other background syntaxes. Thomas Porter; Tom Duff. Compositing digital images. July 1984.